Opinions should be based on at least 5 minutes of first hand experience. But please stop turning your assumption of something you have never tried into negative comments about Twin Trim. I had offered you a free trial of the system and a bargain basement price if you so chose to keep it after testing. You told me it wasn't worth your effort to have to remove it and send it back because you already new that you did not need it. I called and left messages when I was in your area with an equipped boat last year so you could go for a ride, never heard back. I was not doing this for a sale, but to introduce you to something that (if you ask customers) is very beneficial to a cat operator. It is not going to change the boats characteristics, But it does allow you a tremendous amount of instant control that was before unattainable. This is about HOW YOU INTERFACE with your boat. It seems that you would prefer to put ANYTHING else available on your boat except for this, that's fine, no problem. But for everyone else who may have interest we understand how you feel about it. Let's just agree to disagree, And you can ignore everything else about this subject from here on out. phdoerner wrote: I am the owner of a 2008 32 EC. 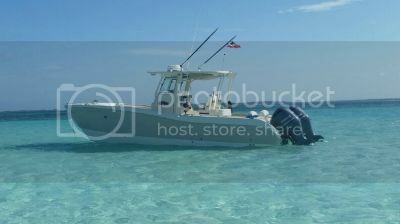 At this years Miami boat show I Sea trialed the new 32 CC with Scott Ellis. Boat ran great. On that boat was a beta unit for single control of trim (dual up, dual down, roll port, roll starboard, etc) made by Twin Trim. I was impressed by the Trim control and ordered one for my 32 EC. When it arrived, it took me a couple of hours to install it on my Suzuki electronic controls. It was fairly simple to do as much of the install was plug and play. Once installed it was time to run my boat with the Twin Trim unit. John Fraleigh (inventer and manufacturer) talked me through what I should expect in running my boat with the Twin Trim and its added capabilities. I ran it a few weeks ago in my home waters on the West coast of Florida, first in flat water and a week later in Rougher (3-4's) water. It handles smoother and is faster and tighter thru the turns than my previous set up. John was correct when he advisesd me that it may take a little bit to get used to. After a few hours of seat time however, I am very comfortable and love the system. The ability to level my boat with one touch in changing sea conditions is a joy. Also, no longer do I need to look down to adjust the trim one button at a time on the dash mouted Suzuki single trim controls. I dont have/need tabs on my boat, but for those that do, the Twin Trim module will control them as well in conjuction with the motors. For those that may have an interest, i suggest you call John and discuss your current set up and needs. His website is twintrimusa.com. This looks and smells like "SPAM" , for a first time poster; no introduction, no boat information, and pushing this equipment. Me think SPAM! He basically wrote the same thing on THT forum. Welcome aboard new World Cat forum members, phdoerner. Please fill out your SIGNATURE , so we can readily determine your model boat,engines,and accessories in the future. gators 2000,thanks for your signature ,however it is a little brief. Look at Harrys, Beast ,and Coneheads and abbreviate accordingly. We can't help in some cases w/o more info. After re reading all the WC and The Hull Truth ,this my opinion. Last edited by conehead39 on Wed May 12, 2010 10:32 am, edited 1 time in total. "We also have new members Phdoerner FOR it and Gators 2000 AGAINST it." To be clear, I would not say I'm against it. I don't know enough about it to say that I'm for or against it really. What I said was I believe it is not really necessary in order to have your boat perform well. In my mind it is an option; like radar, gps, outriggers, ect… The truth is I’ve only been driving a Cat for a couple months now. All my previous capt. exp was on Mono’s. That being said, I think I can maneuver the boat pretty well and I have a number of other things on my list of things to get before I spend $600 on a different trim system. Not because I think it doesn’t work; rather because I’m comfortable with the way it performs now. Anything more would simply be icing. Conehead – I’ll look into the sig thing! A- I don't think the 33te, 320ec, or 32cc need any additional trim help. I keep my motors trimmed equally up/down depending on load/fuel/seas. No side to side adjustment needed, I believe due to the beam. And it leans into turns fine. 2- after reading about and riding a little bit in a 27sd, I believe the 27s and 25s would benefit from the Twin Trim system. And I will test drive it if/when I buy a 270SD. D- I don't mind free advertising on forums. I know forum owners make money from advertising like THT and Scubaboard. But these forums are for us the user, to share experiences and help each other. I value the presentation of new products and of peoples opinions of them. Even peoples opinions who haven't tried the product, as long as it's an honest opinion. Most of the guys here appreciate the Beast, and know to take his tirades with a grain of salt. It is what it is. I say: good luck with the new product, I believe there is a niche market for it. And I look forward to trying it out someday. OK Mr. Fraleigh, I refrained from answering any of your posts until I had time to research ALL of my posts regarding your Twin Trim units. NOW I'M CALLING BS!!!! You jumped all over me with demeaning and derrogatory remarks that were unfounded. Well here ya go Mate! Until this thread, I made a total of 4 posts out of all the threads that you have participated in with mention of twin trim. All of which were polite and even apologetic. I respectfully ask everyone to re-read his quote then read these threads. You can judge for yourself exactly what I wrote concerning his product. It is funny that it is almost verbatim to what I wrote in this thread. Mr. Fraleigh... You're a real piece of work! I went some what overboard towards you. 4 1/2 years later rebuilt to maybe 40% of what we had here we go again. Needless to say everyone's nerve's are shot to hell.